Just got my first Rare: Brie Bella. Been stuck in the Ultra Rare++ tier for about a week now. I've only pulled two UR: Undertaker and Dolph Ziggler. It's kind of irritating honestly. Kidd is okay. His charisma is extremely low though. I'll replace him as soon as I can pro another SR. I've been stalled out for a while. My record has gone into the shitter because my Epic Pro AJ Lee is pumping my level higher than the rest of my deck, but the only way to have a chance to get the higher tier rewards is to keep her in. Just picked up a second Epic Hogan from not qualifying for Legendary KotR. Hopefully once I max him out I'll get a bit more competitive. I'm struggling to get a second Epic anything, I'm just entering the KOTR and leaving it in the hope of getting a second to make a Pro. I'm purposely jobbing out of the KOTR to get UR cards. I'm assembling an army. I entered an Ultra Rare KOTR with hopes of just scraping into the quarter finals and ended up with little effort losing 2-1 in the semis. If I'd had time to farm energy cards today, I would probably have reached the final and got a pair, but an UR Daniel Bryan and SR manager is a pretty sweet reward. Got an Epic Razor to go along side my Epic Bray, Big Show, Rey, Kane, Hogan, Batista and Rock, none of which are any good till I can get a second. Dean vs Seth is this months Peoples Champion tournament. Both sides get the cards still right, did we confirm that? Yeah you just get the cards from the winning side. Ambrose is killing it at the moment, a huge lead over Rollins. Ended up on Team Seth. Twice in a row I've accidentally picked the wrong team. If all of the matches in a KOTR quarter final end 2-0 do you move on to the Semi straight away or to you still play game 3? You don't play the third fall but you have to wait for the other players to catch up. Got 3 games out of it, so many network errors I've gave up. The guy currently in first in people's champ has over 17,000 points in a little over 24 hours. How is that possible? No life and bought cards? Moved up to Ultra Rare rank in KOTR, looking forward to doing a couple of tournaments now I'm guaranteed get some decent cards. 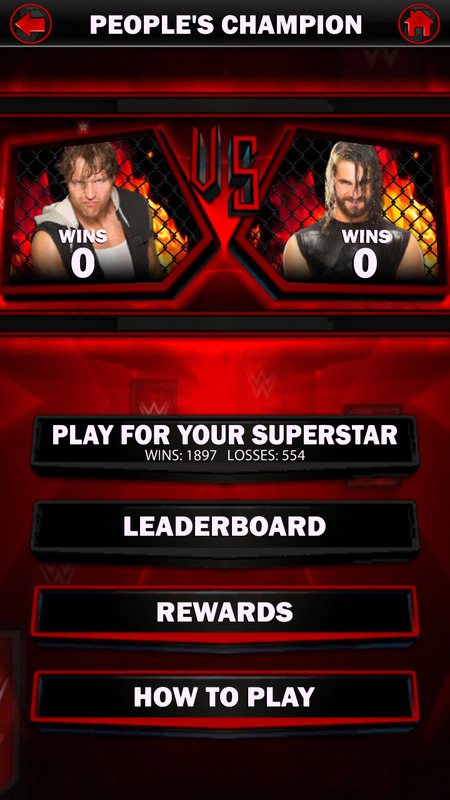 Ever since utilizing KOTR @ Epic level to try and job out of it has worked for me. I was going to farm the Ultra Rare cards you get from not qualifying, but I found myself winning quite a bit and finding what little time I had to switch the lineups out. It's a great game for me as I currently spend a whole lot of time with my baby daughter and she likes to watch cards battle each other. I was convinced to put this on my phone again and have given up, hopefully for good this time. There's no destination. Playing the matches isn't fun and getting the cards isn't fun because you know it's really about pro versions. Meanwhile the gift Cena and Paige cards have homogenised everything. He might have bought those bonus point things. Makes every match double the points. Entered my first UR KOTR the other night and I've just won it. It's the first one I've won out of the hundreds of tournaments I've played. Last I looked Ambrose had over a ten million lead, don't think the other People's Champ matches have been so one sided. Brock Cena was technically over by like the second day or earlier. Ambrose seems to have the biggest gap lead and the first ever face victory. WWE better take note.